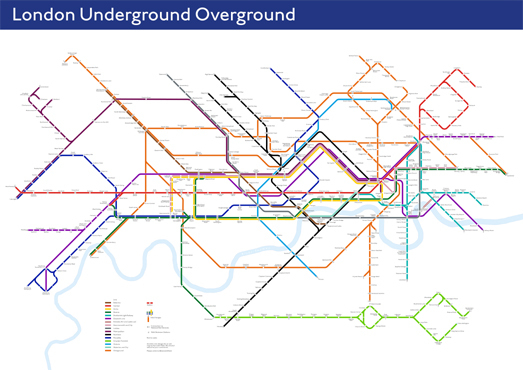 Over recent years the London Underground map has begun to look a little cluttered as new Transport for London (TfL) services such as the London Overground and the DLR have been added to the map. A consensus seems to be emerging that the official TfL London Underground Map is now too busy and complicated. Which is probably why in just the last month two different cartographers have released their own London Underground maps. One of these cartographers is Kenneth Field, who has been inspired to design his own version of the London Underground Map. You can view an interactive version of Kenneth's map at London Underground Overground Map and view a static, printable version of the map at Make a Transit Map in ArcGIS Pro. The Make a Transit Map in ArcGIS article includes instructions on how the map was made and explores some of the reasons for the design choices made in creating the map. One significant change in Kenneth's tube map is the depiction of the River Thames. In the official TfL map the Thames is represented schematically and it follows the same design principles used in mapping the individual transit lines, which are depicted using either straight horizontal & vertical lines or lines at 45° angles. On the London Underground Overground Map the Thames is depicted geographically rather than schematically. The other recent redesign of the London Underground Map has opted to completely ignore the straight line rule imposed on many transit maps around the world by fans of Harry Beck's original London tube map. 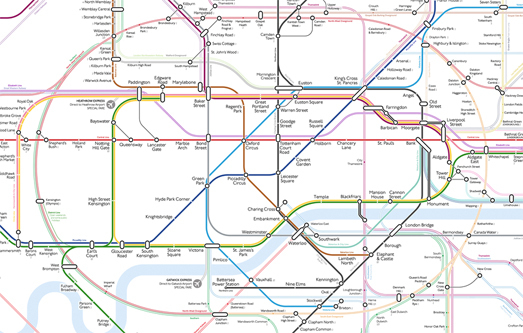 Luke Carvill's London Underground map contains lots of sweeping curves. In particluar a large oval overground line is used to draw the eye into the central London area of the map. Zones 1 and 2, which Luke says are the zones "mostly relied on by tourists", is therefore clearly framed on the map by the oval overground line.